Inspired by Tim Shorts' excellent and frank post on zine sales and expectations I thought I'd do similar in the hopes of maybe helping someone out, or at least providing another point of comparison to the original article. This is from limited experience but take what you will from it. I got into publishing out of nowhere. I had a blog that no one read, knew next to nothing about the G+ scene, came out of the gate with no one at my back (except a few notable exceptions, thank you Tim) and no reputation to lean on. I was prepared to sell 10 copies and call it a success, a fun vanity project and excuse to mess about with a new medium. Fortunately I was way off. Seeing that there was interest and numbers I decided it would be fun to push it to be profitable and self-sustaining, turn the whole thing into a game. Obviously, to play a game properly you can't cheat, so I decided that everyone had to be paid for any work (except my excel monkey, he can put "Consultancy Fee" on the excel sheets all he likes), even me. So far this has been more successful than I'd expected, with the zine being 6 sales from profitability right up until the printer broke. So it goes. Similarly, games need objectives. Other people's posts like this have offered me realistic targets in sales to aim for. I'd definitely recommend getting yourself some people you aim to beat (please feel free to aim for me), it's all part of the fun of it. Reviews matter but are hard to get. Prepare to be politely ignored. Don't sweat the price, charge what you need to turn a profit. This is a community of whales who will put their money into stuff that interests them. You are not a proper business so don't stress about acting like one. Be comfortable with being unprofessional and honest. Have fun and do what you want to do, ignore the shrill and the barbed. If you fail, at least fail on your own terms. Don't be afraid to approach people that know what they're doing. The worst that will happen is you get ignored. Charge for PDFs! Make the same profit margin on a PDF as on a print copy, they're the same thing. Don't feel you need to "earn the right" to do anything. Just go nuts, act like you know what you're doing and it'll follow. I have the great luck of having a chum who thinks managing spreadsheets is a legitimate pastime so I have extensive and more-or-less accurate records of every penny this venture makes and loses. RPGNow accounts for an unfortunate amount of my sales. Unfortunate because they take a cut, twice, once at sale and once when you take your money out. On a small margin thing like this it's a bit of a killer so I decided to just up the price to account for it. I reasoned that RPGNow is just a convenience outlet, the buyer pays for the convenience while I still get as much as I would from other sources. Orcs Nest is London's FLGS, getting them to take copies was just the best confidence boost. Hearing they were warning customers that it was weird and gross just sweetened it. Orcs Nest sales are the only place I don't make the same profit as everywhere else since I reasoned it's a vanity/prestige thing to be in there. Shops don't want to be undercut by the publisher, so I have to eat their cut essentially. I recommend you email local FLGS's and ask if they'd like some of your stuff. No harm trying and it's very exciting to see something you wrote AND published sitting on a shelf in shrink wrap. As you can see, August sucked. On a small product like a zine you only exist as long as people are talking about you, which in Internet Land is based on how popular and prolific you are. In my case: not very. It's interesting how small my UK footprint is. I'm not sure why but I assumed it would be much more brisk in the home market considering I'm pretty much it when it comes to native OSR zines. Me and my excel monkey were discussing projected sales on issue #2. He thought that #2 would sell less than #1, #1 acting as a "cap" on possible sales. I thought it would blow it to hell. Luckily I was right and #2 has kicked the crap out of #1's first month in under 2 weeks. I blame three things: Contributors that people like more than me, it's just plain better than #1, and reviews. It probably also helps that there are a few people watching me now, compared to the 0 that followed me when #1 came out. You'll also notice that subscriptions have done quite well. On the upside I have more operating cash to funnel into my "Dan broke his printer again" fund, but I worry that it'll eat into future earnings. We'll see in a couple of months though. It's obvious now, but selling another issue revitalises sales on everything. Make more stuff! I've made a point of listing every tiny expense on here (you've gotta play the game right!). As you can see, setting up is a bit costly but very realistically recoverable. Even the printer will likely be paid for by the time #4 comes out. As for paying folks, I'd say I got my money's worth. The first thing that'll happen as soon as this is profitable enough to pay me is a pay hike for commissions, they're worth it. I do suspect that paying for work intimidates some people into not getting involved though, but this is yet to be confirmed. So there you have it, a spreadsheet dump. I hope this has helped some of you in some way and do feel free to pester me for assistance if you think it will somehow help. Oh my, what a day. I run out of toner and then I accidentally release The Undercroft #2 early on RPGNow. Here I am with no promotion material written, no people lined up to pester and no damn toner. At least until Monday, but a weekend is a damn long time to glare at an empty printer and a stack of paper. Either way, here it is! Finally pulled the difficult second album together and I think it's a resounding success. With original artwork and outstanding contributions I think it is a marked improvement over the first issue. That Which Sips Between by +Luke Gearing , a terrible creature, a force of abstract nature, with an adventure involving it by +Simon Forster . +Matthew Adams has contributed three creatures straight out of a fictional folk lore. 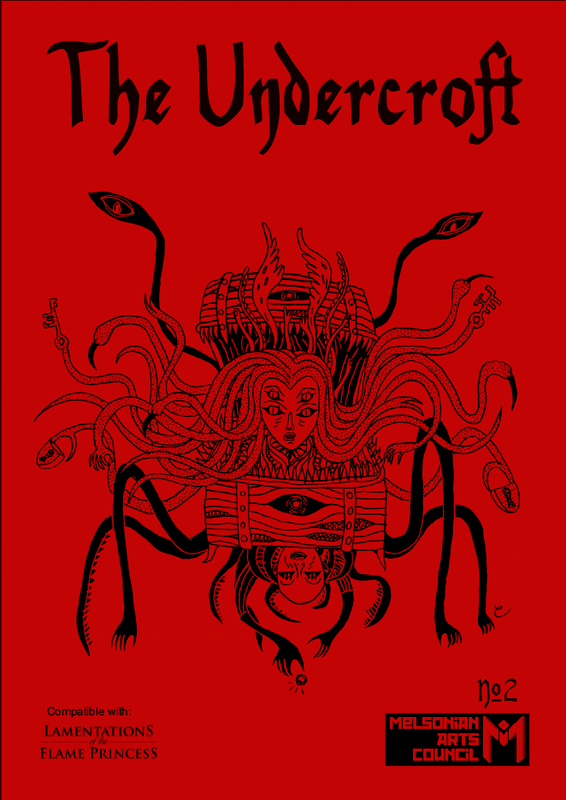 I contributed a few unpleasant monstrosities, illustrated by +Matthew Adams and +Claytonian JP . And finally, +Simon Forster again. He wrote a particularly good short story that captures the feel of the publiucation. There seems to be two main camps in the field of zeening (new word, gonna catch on) . One group primarily collect and put out work as an anthology with varying degrees of their own and others' work - we'll call these curators - while the other consists of single authors, or auteurs if we wish to be needlessly fancy (we do). Anyone that has followed The Undercroft knows that the first issue is more-or-less an auteur work, whereas for the second I trawled the OSR (quite successfully) for contributions. The second issue isn't out as of the time of writing, but it is finished for all intents and purposes. From this I can tell you that I enjoyed making #2 an awful lot more. I met good people and got good work from them, I even got a collaborative Mystery Top Secret side-project out of it that I'm just itching to get done. I also believe that #2 is the superior work in terms of pure content, my own and that of the writers and artists, but that's yet to be confirmed so we'll ignore that for now. The change in production has spurred me to thinking about the future of the zine, what I want and where it needs to go. In a world of rampant blogging it's hard to decide on a place for a zine. Where does one draw the line? Do you pull back from vomiting your brain onto the internet so as to save it for print? For the auteur the decision is obvious: you need to keep your mouth shut sometimes. As a curator you can continue to give it away for free like the slutty little writer you are. I know I can't keep my creative legs crossed, it's why I keep getting knocked up with side projects. You could of course just take your blog as a collection of first drafts, which it probably is in most people's cases. Even the best blogs aren't putting out publishable content, it takes a whole new level of work to get something clean and tight enough to charge money for. I'm certain there are people that disagree, that rough raw ideas from your blog are worth publishing, but I don't buy it. Ideas are cheap, tortured artists are two-a-penny. Anyway, I've stolen from myself a couple of times now with, I feel, good results. Like all second (3rd, 4th, 5th...) drafts it reveals more about that nugget of an idea you had one late night of attention whoring some months back. Is this good enough though? Does the nugget have to be new to be worth selling? Does anyone even read or care about blogs that much? It's easy to forget that the OSR is pretty damn small, well read and inbred, expecting outsiders (hisss!) to be familiar with your work is pretty silly. Should a zine and a blog happily step on each other? I know I don't keep up with everything everyone makes but I do buy your zines. The instant it's on paper it's permanent and important. The magic of the printed word, can't avoid it. The Undercroft will continue as a collaborative work, if only so I can interact with people in a productive environment. You learn a lot about folks when you work with them and have to produce a finished product, you can't just faff and waffle like the internet loves to do. You need results, you create a mini parenthood and raise a horrible monster to set loose on the world. It's a thrilling shared experience that can lead to bigger things. Another important distinction between curators and auteurs is that one needs to define their working relationship. From the beginning I didn't want it to be a fuzzy"do me a favour" situation, I wanted there to be definite compensation for work. Yes, I pay awfully (as much as the zine can afford, which will hopefully raise if things go well), but I pay. It's a token with no ambiguity, it defines a relationship and creates an exchange. This is not a favour, you are being rewarded for being good at something, as you should. I know some people do it for the joy of it, which is great, but that's a risky situation for a curator to be in. People help you because you are popular, well respected, or their friend. You can't enter a scene from out of nowhere and expect to get free help, at least not of any great calibre. Maybe you aren't the most personable guy? You don't have to be a good person to make good stuff, arseholes are arguably better at it even. How do they get help before they've attracted their groupies? Maybe when zines were novel you could just roll up and thumb the back of your truck, but today you're tripping over new zines. You could say "I don't care if no one reads my zine (or blog, or whatever)" but that's a big old porky, isn't it? If you don't care if people don't read your work, don't present it to them. Have the decency to care and believe in what you're putting out. So there you have it. A rambling insight into my zine-related thoughts as of the last week or two. If you look carefully you can pinpoint the exacpt moment I started to stumble into "And another thing!.." territory. Please feel free to assist in sifting through them or add your own. Keeping track of mundane equipment when you're an up-and-coming hedge knight is such a chore. So, to remedy this awful bore, introducing the new Ready-Mule™! A ready-mule can carry 20sp worth of gear per encumbrance point (as per the rules found on page 39 of the Lamentations of the Flame Princess rulebook). So a typical animal can carry 200sp worth of items before it is encumbered. The items it carries are not listed, simply mark what encumbrance points are "ready-bags". When you need something you haven't specifically listed as carrying along, buy it from the list below using the pool of ready-mule money. Ta-daa! You have that item, you are so good at packing for journeys. Often this will not match up to the 5 items per encumbrance point rules, this represents the fact that this particular animal is carrying stuff, bits and bobs. It's a mess of obsessive buying of rainy day items. You can top up the ready-mule next time you get to a city or other area of significant trade. This is a modified list taken from Lamentations of the Flame Princess. Italics are not encumbering, italicised bold are oversized. This is only relevant when you've taken them out of the ready-mule and are carrying them properly.